Something truly shocking happened this week: A UN official publicly called out Hamas for “stealing from their own people and adding to the suffering of Palestinians in Gaza.” The shocking part is that someone from the UN actually bothered to comment. Usually, international officials prefer to ignore such malfeasance, lest admitting it undercut their claim that Palestinian suffering is Israel’s fault. Yet exacerbating Palestinian suffering is actually standard practice for both Hamas and the Palestinian Authority, as demonstrated by several media reports from the past two weeks alone. The incident that outraged Nickolay Mladenov, the UN’s special coordinator for the Middle East peace process, came to light last Friday when Israel suspended shipments of cement to Gaza’s private sector. A senior Hamas official had been confiscating sizable portions of those shipments for the organization’s own use – i.e., to build tunnels with which to attack Israel. By seizing cement earmarked for the private sector, Hamas was violating the terms set by international donors, who are funding Gaza’s reconstruction after the Hamas-Israel war of 2014. Moreover, as Mladenov pointed out on Monday, this cement is critically needed to rebuild the houses damaged or destroyed in that war and “to enable much-needed infrastructure and development projects” in impoverished Gaza, where the unemployment rate stood at 38.4 percent in fourth-quarter 2015. Hence, his rare outburst against Hamas. 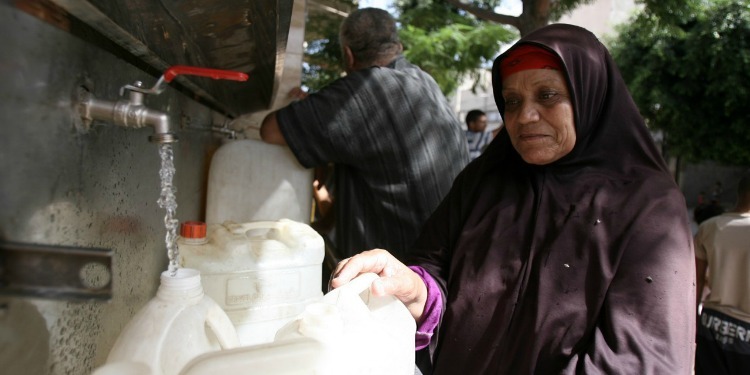 But the ongoing water crisis in Gaza has not elicited such passion. As Haaretz reporter Amira Hass noted ten days before the cement shipments were suspended, a whopping 95 percent of tap water in Gaza is already undrinkable due to over-pumping. The UN foresees irreversible damage to the aquifer by 2020. As Hass correctly argued, the quickest and cheapest way to solve Gaza’s water shortage would be to buy more water from Israel, but the PA rejects this solution. Instead, it’s working with international donors to build a desalination plant, which won’t be ready for years. It fears that the Hamas government will not bother to pay the water bills, as has happened with the electricity bill. Israel will then deduct what is owed directly from the customs duties it collects for the PA and transfers to Ramallah. Once again, the Palestinian people are trapped by the Fatah-Hamas feud. In short, Gaza is suffering a completely preventable humanitarian crisis because the Palestinians’ two rival governments can’t agree on who should pay for more water. Yet the international silence has been deafening. On the same day that Hass’s column appeared, Israel Hayom reported on the abandonment of an Israeli-Palestinian business center located at a crossing between Palestinian- and Israeli-controlled sections of the West Bank. The center was supposed to facilitate Israeli-Palestinian business by providing a place where businessmen could meet without the Palestinians having to go through the bureaucracy of obtaining a permit to enter Israel. One might think this is something the PA would want to encourage. After all, the West Bank needs more business opportunities; its growth rate in the fourth quarter of 2015 was an anemic 1.0 percent, and its official unemployment rate stood at 18.7 percent. Moreover, Israel is a logical place to look for such opportunities. It’s already the PA’s main trading partner and the only one of its neighbors with a developed economy. Instead, the center has been closed since the wave of Palestinian stabbing attacks against Israel began in October 2015 – not because Israel shut it down, but because the PA forbade Palestinians to go there. Presumably, having spent the previous month hurling vile slanders such as that Israel was committing “genocide” and that Jews were “desecrating” Al-Aqsa Mosque with their “filthy feet,” PA President Mahmoud Abbas had to show he was working to prevent “normalization” with such a terrible country so as to placate the anti-normalization thugs who routinely try to shut down every form of Israeli-Palestinian cooperation; from private-sector conferences on coexistence to Palestinian franchises of Israeli clothing chains. Closing the center didn’t hurt Israel, whose economy isn’t dependent on the Palestinians; it primarily hurt the Palestinians themselves, who need the jobs joint Israeli-Palestinian ventures could provide. But once again, the international community had nothing to say. The above examples — and there are countless others — are important even if you (wrongly) blame the lack of a Palestinian state entirely on Israel, because they show that even if Israel left the West Bank tomorrow, it would solve very few of the Palestinians’ problems. An Israeli withdrawal wouldn’t make Hamas stop stealing cement from its people; it wouldn’t end the PA-Hamas feud over who should pay Palestinian water bills, and it wouldn’t stop the PA from impeding its people’s business activity. Thus, anyone who actually wants to see a functioning Palestinian state emerge would be better off focusing less on an immediate Israeli withdrawal and more on improving Palestinian governance. Otherwise, based on the record of both the PA and Hamas to date, any Palestinian state that did arise would be just another failed Arab state. And another failed Arab state are the last thing the world needs right now.